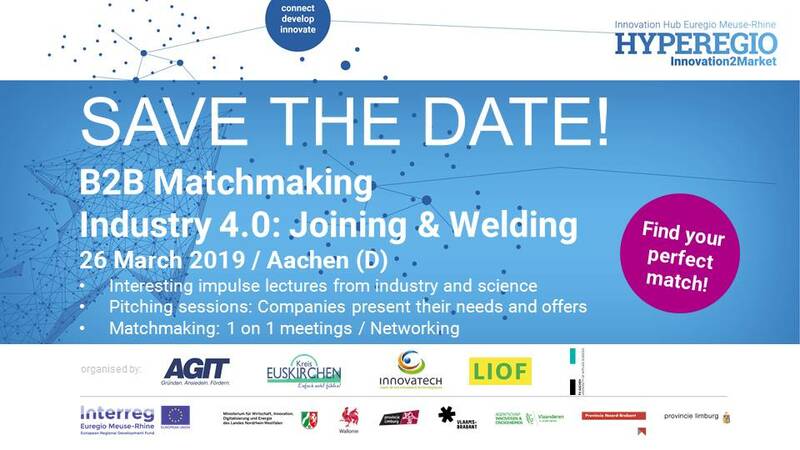 Due to a lack of participants we have to postpone the B2B matchmaking event “Smart Industry: Joining & Welding” planned for 26 March in Aachen to a later date. New products and materials require new joining technologies. Identical but also different materials are to be connected with each other. This offers opportunities to conquer new markets with new products and services. Experts from the Euregio Meuse-Rhine will inform you about proven processes and current trends and challenges in joining technology. Several companies will present themselves with short presentations (pitches) in which they will also explain their concrete ideas for a cooperation. You will also get to know each other in one-on-one meetings to discuss questions or approaches to solutions in detail. Please keep in mind: As part of our “Innovation2Market” project we provide financial support for cross-border cooperation! DRUM Engineering develops, produces and sells high-tech equipment mainly for resistance spot welding. We make production and resistance spot welding safe, transparent and efficient. We focus on products that are unique and/or provide an extraordinary customer value. Our databased software for analysis and visualisation of production data is adaptable to different production processes and offers a consolidated and transparent view into production which is available on various devices through a web-based user interface. TEGEMA is a group of 100 engineers and specialists located in Eindhoven and Arnhem The Netherlands. TEGEMA is a system integrator who has specialized itself in bonding and joining technologies with a strong focus on production performance. AGIT, Kreis Euskirchen, FH Aachen, InnovaTech and LIOF.